Would the Loch Ness Monster have been named after Queen Elizabeth I if its existence had been proven beyond doubt? So runs an interesting article based on the archive of papers belonging to Sir Peter Scott, one time major advocate of the Loch Ness Monster. It seems her Majesty was following the mystery of Loch Ness during those heady days of the 1960s and the suggestion had been made by Scott that the creature be named "Elizabethia nessiae" in the light of its scientific discovery. Naturally, the Palace did not warm too much to such a suggestion. I was aware that Prince Philip had a keen interest in the Monster and that Tim Dinsdale, somewhat presumptuously but patriotically, had desired that the Queen was first to view his 1960 film. This story brings a bit of extra gloss to those human satellites that orbit that great planet known as Nessie! From the royal stable of thoroughbreds to her loft of racing pigeons, the Queen’s fascination with creatures great and small is a lifelong affair. But until now nothing has been known of the monarch’s passion for another sizeable beast of her dominion - the Loch Ness Monster. New research into the heyday of the hunt for Nessie 50 years ago has revealed for the first time how the Queen was “very interested” in the quest to solve the mystery of the mythical life form swimming some 70 miles from her Scottish Balmoral retreat and asked to be kept informed of all developments. The Sovereign’s curiosity, which seems to have been shared by the Duke of Edinburgh, was piqued by the efforts of Sir Peter Scott, a war hero turned eminent naturalist, to launch the first comprehensive scientific investigation into the possible existence of a prehistoric animal in the waters of the Scottish Highlands. Documents unearthed from the archive of Scott’s papers held at Cambridge University and seen by The Independent show how the scientist, who was the son of the famed Antarctic explorer Captain Scott and went on to co-found the World Wide Fund for Nature (WWF), even went so far as to suggest eventually naming Nessie after the Queen - putting forward “Elizabethia nessiae” as a possibility to the Palace. Sir Peter, who was known to senior royals after his sculptress mother once made a bust of King George VI and himself once drew a portrait of the young Princess Elizabeth, wrote to the Queen’s assistant private secretary Martin Charteris in May 1960 revealing his proposals to track down the monster. In reply, Charteris, a friend of the formidably well-connected naturalist, made clear the Palace’s enthusiasm for the project, adding it would be “great day in the zoological world if it can be proved that a hitherto unknown animal exists”. Charteris, who served in the innermost circle of the Queen’s advisors for nearly 30 years, made clear he was also showing the letter to the Duke of Edinburgh, who later became president of the WWF. But the courtier was distinctly more cautious about the matter of lending the monarch’s name to a creature of uncertain existence, and potentially unprepossessing appearance. With full royal reserve, he wrote: “If there is any question of naming the animal after the Queen, there must of course be absolutely irrefutable evidence of its existence. It would be most regrettable to connect Her Majesty in any way with something which ultimately turned out to be a hoax. The remarkable exchange was sparked by the decision of a leading Loch Ness hunter - an aeronautical engineer from Reading called Tim Dinsdale - to write to the Queen a month earlier offering to show her a three-minute film he captured of a “Nessie” swimming across the lake. The documents, uncovered by a Cambridge post-graduate researcher, cast new light on the evolution of the post-war Loch Ness Monster hunt and the way in which a group “gentleman amateurs” from the heart of the British Establishment, led by Scott, organised the most serious attempt yet to try to resolve the question of what, if anything, was lurking in the dark, landlocked waters adjacent to Inverness. Sir Peter, a wartime Royal Navy officer decorated for his valour in battles including the ill-fated Dieppe Raid, had rapidly established himself in peacetime (after an unsuccessful flirtation with trying to become a Conservative MP) as a pioneering conservationist, successfully saving the “nene” or Hawaiian goose from extinction in the 1950s. His standing among eminent zoologists as a well-regarded naturalist therefore stood him in good stead when he sought to mobilise British scientific opinion - hitherto resolutely scornful of the existence of the monster - to support a programme of searches to get to the bottom of growing speculation that Loch Ness was home to one or more plesiosaurs, the waterborne dinosaurs that swam the Earth’s seas 250 million years ago. The paper held at Cambridge University Library show that Scott was careful to bring a scientific rigour to his investigations while harbouring his belief that it was “more than probable that an undescribed animal lives in Loch Ness”. But despite winning the broad support of his confreres for what one leading zoologist described as a beast belonging to “the category of ghosts and fairies”, Scott failed to gain public backing or finance for an official body to pursue Nessie. Instead, in 1962 he set up a private group - the Loch Ness Phenomena Investigation Bureau (LNPIB) - with the help of his wartime comrade and Highland laird, David James, a Conservative MP and friend of the Duke of Edinburgh. Although James was initially reluctant to pursue Nessie - he wrote to Scott telling him he had “entered the House to make a reputation and not destroy one” - the resulting partnership proved formidable. Along with another public school-educated conservationist called Richard Fitter, the group not only grabbed the attention of the monarch but pulled strings to gain a loan of Ministry of Defence equipment in the shape of searchlights to sweep Loch Ness and the services of an elite military photo-reconnaissance unit to scrutinise images from the lake. The modern consensus is that the subsequent searches were always doomed to end in vain and Nessie was the product of a critical mass of optical illusions, crude hoaxes, clever marketing and wishful thinking. But those who knew Sir Peter argue it is easy to forget the spirit of zoological discovery that existed at the time and the global fascination with the Loch Ness Monster that raged in the 1960s. 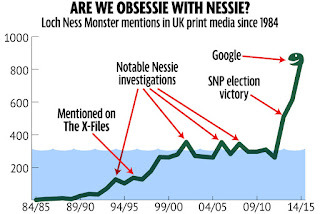 As well as Buckingham Palace, the interest even reached space when a Parliamentary debate on how to preserve Nessie was apparently broadcast to Apollo 11 astronauts en route to the moon. After more than a decade of LNPIB searches, Sir Peter eventually went public with his belief that Nessie existed in 1975 when photographs taken by an American patent lawyer, Robert Rines, appeared to show the fin of a passing animal caught on underwater cameras. Scott declared that there was “no further doubt in my mind that large animals exist in Loch Ness”. The episode was to end in embarrassment. It was found that the Rines photographs had been computer enhanced without Scott’s knowledge and in fact showed only images of debris on the loch floor. Sir Peter’s discomfort was not helped by the discovery that the Greek name given by him to the creature - Nessitteras rhombopteryx, meaning “Ness wonder with a diamond shaped fin - was an anagram of “Monster hoax by Sir Peter S”. The naturalist, who is credited with helping to shape much of the modern conservation movement, continued to believe that something extraordinary had plied the waters of Loch Ness until his death in 1989. But it is unclear to how far beyond 1960s the monster chase in the Highlands continued to be followed by the Queen. She's been scunnered by the sceptics, dumped by the debunkers and disputed by the doubters. You would have thought Nessie would have disappeared a long time ago. 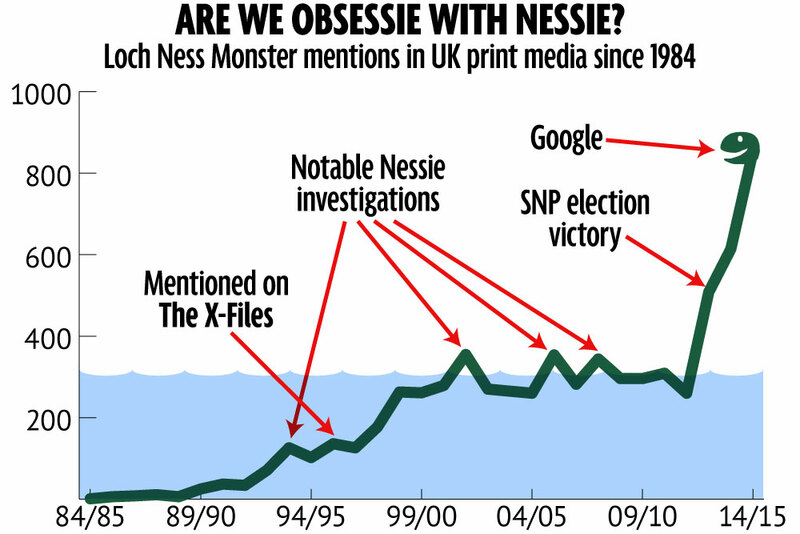 But the Loch Ness Monster just keeps motoring along as this graph from a Mirror article shows. The article author consulted the number of mentions of the famous monster in the print media since 1984 and came up with the graph above. I won't attempt to critique the graph or search for cryptozoological and sociological reasons for this surge. It seems that people just like to read Nessie stories. Note the graph takes off in 2012. This blog started in July 2010 and so has nicely caught a ride on this wave, arguing the case for the Loch Ness Monster and making a regular appearance on the first page of Google hits. Long may the ride continue! As a comparison, here's the Google Ngrams plot of printed matter references since 1933. BBC4 will be televising a programme on the giant Amazon Otter tomorrow at 2200 GMT from the series "Natural World". Those interested in the master otter theory may like to watch this.